Is your document scanner in need of repair? With scanners being used more and more in the business world we’ve found an increasing demand for document scanner repair services. Scanner One can help with this increasing demand for repair whether you’re a current customer or you’re just searching for a a place to get your scanner fixed. Scanner One officially launched its blog today. Scanner One is an Authorized Sales and Service Provider for Canon scanners, Fujitsu scanners, Kodak scanners, and Panasonic scanners. We specialize in business class scanners from entry level scanning to high end production scanners for organizations of all sizes. We have created this blog to help consumers keep up with new product releases, monthly deals on new and refurbished scanners, and to supply tips for keeping your scanner in top quality condition. Canon has announced the discontinuation of the Canon DR-2010M for Mac scanner. 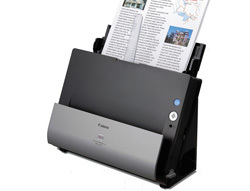 This document scanning unit has been replaced by the Canon DR-C125 PC/MAC compatible scanner. To review the full specs for the replacement scanner please visit the DR-C125 information page at ScannerOne.com. Scanner One is an Authorized Sales and Service Provider for Canon scanners, Fujitsu scanners, Kodak scanners, and Panasonic scanners. We specialize in business class scanners from entry level scanning to high end production scanners for organizations of all sizes. We have created this blog to help consumers keep up with new product releases, monthly deals on new and refurbished scanners, and to supply tips for keeping your office equipment in top quality condition. You can order all of the scanners easily online by clicking the links as indicated. Please contact us if you have any questions and we will be happy to email you or call you back with any information you need. View ScannerOne.com and scroll through the scanners to find the one that best meets your speed and budget needs.